From 1910 down through 1914, in addition to the semi-automatic attachments, rifles of Springfield Armory design, and the Schouboe, tests were made of some six other models. Drawings of others were examined but no models sent for test.50 Five of the six models tested were discarded rather promptly, the Standard Arms Company model, the Dreyse Automatic Carbine, the Kjellman Automatic Rifle, the Benét-Mercie, and the Rock Island Arsenal model. Only the Bang semi-automatic received prolonged consideration. 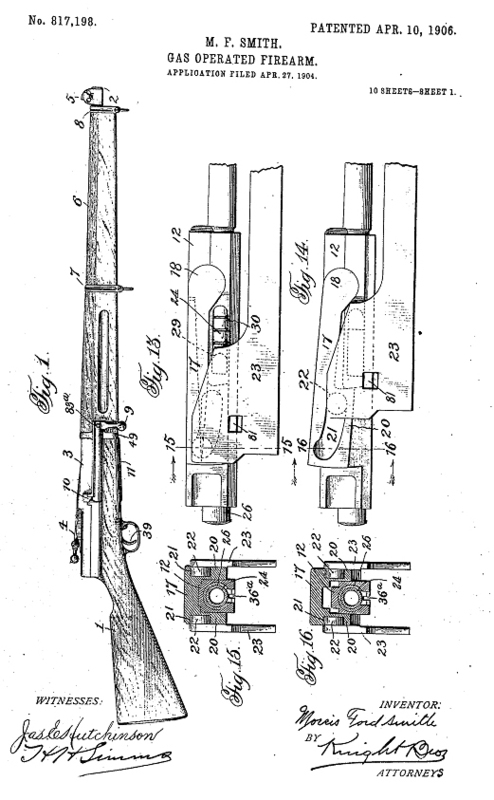 The same criticism of not being strong enough to use service ammunition resulted in the rejection of the Dreyse Carbine and the Kjellman Automatic rifle. In the case of the Dreyse, tested on September 12, 1910, the report declared the gun neither safe nor sturdy enough.52 The Kjellman, a recoil-operated arm of Swedish invention, was of lesser caliber than .30, did not achieve the desired rapidity of fire or initial velocity, and displayed various other weaknesses. On the other hand, several advantageous features, the 9.72 pound weight, the balance, the few tools required for dismounting, the useableness either as a self-loader or as a repeater, the arrangement whereby the bolt had to lock before the firing mechanism could be operated, and several others, led the Ordnance Department to instruct the Armory to repair the damage done the rifle during the second part of Test XI, (See Appendix II) and then ship the arm to Rock Island Arsenal.53 Rock Island was to undertake further firing tests. e.g. S.A. 109/h, O.O. 34384-65, 2nd Ind., Incl 1, June 21, 1909; 109/j, O.O., 38351-237, 2nd Ind., May 21, 1910; 109/m, O.O. 38351-628, July 21, 1913; 109/m, 38351-645, Incl 1, October 22, 1913; S.A. 110-2, O.O. 38351-731, March 6, 1914.